Believe it or not, today, I purchased my first jicama. I eat it all the time in salads that I buy at Trader Joe’s for lunches at work. Well, as many of you may already know, the hardest part of preparing this vegetable is peeling the darn thing! Thank goodness my vegetable peeler did most of the hard work. 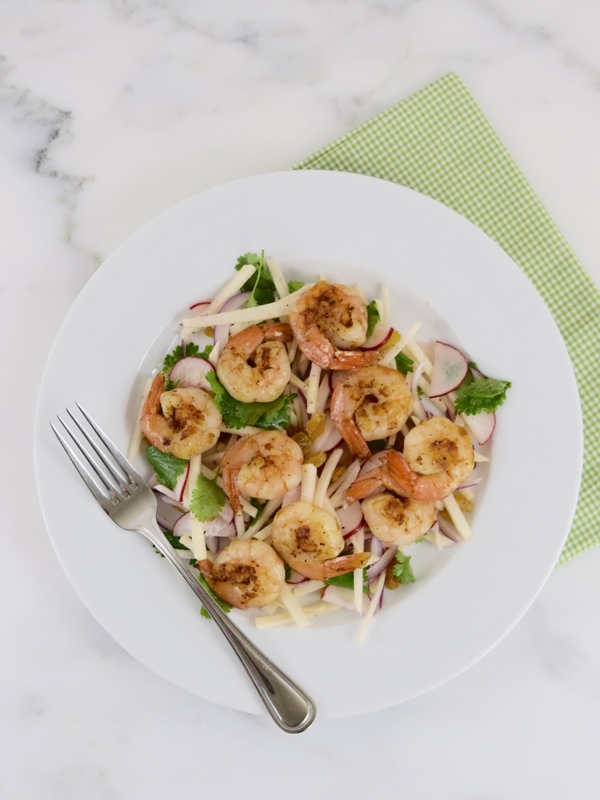 This delicious salad has the wonderful crunchiness from the radish and the jicama, the sweetness from the golden raisins, and “zip” the from the red onion and the cilantro. Oh, we cannot forget the tasty spicy shrimp! This terrific recipe is by Kate Merker, Real Simple, April 2009. It makes a simple, great summertime meal! 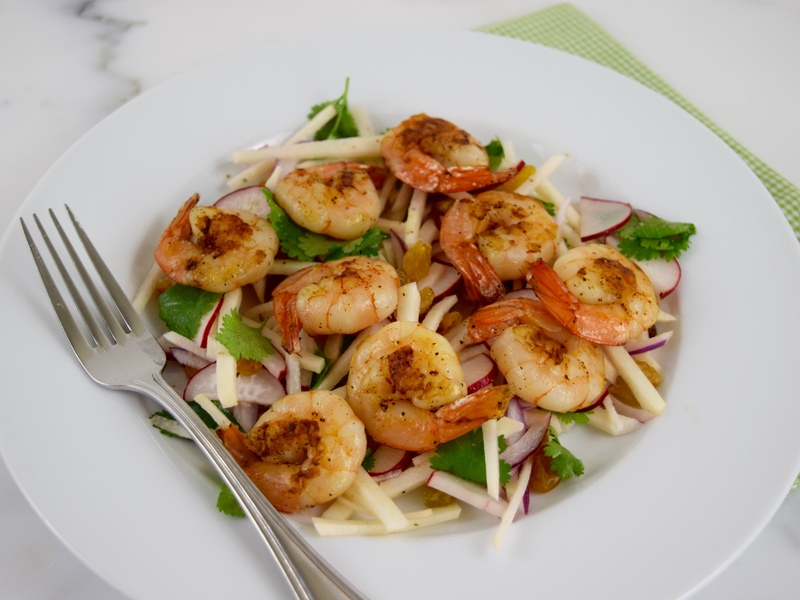 Using a large bowl, combine the jicama, radishes, onion, cilantro, raisins, lime juice, 2 tablespoons olive oil, ½ teaspoon salt and ¼ teaspoon pepper. Set aside. In a medium bowl, mix the shrimp, chili powder, remaining tablespoon of olive oil and ½ teaspoon salt. In a large nonstick frying pan over medium-high heat, cook the shrimp 2 to 3 minutes on each side, until shrimp is opaque. 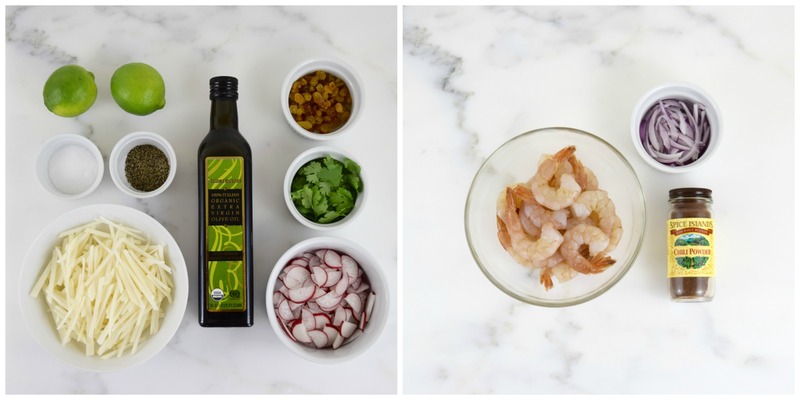 Serve the shrimp with the salad, either on the side or on top. Serves 4. This looks delicious to me! So fresh and I love the crunch of jicama and radishes. I have to confess that I have never bought a jicama either. Thank you for the peeling tip. Thank you, Julie. Make sure your vegetable peeler is sharp! Jicama can be quite tough!